The Chinese phone manufacturer Huawei debuted three new products at a launch event yesterday. The Mate 20 is a slick flagship phone that checks all the existing boxes and then some. Then there’s the Mate 20 Pro, a slightly bigger and even more powerful version of the base phone. And finally, the Mate 20 X, gaming focused phone which Huawei ridiculously positioned as a superior competitor to Nintendo’s Switch. They even showed side-by-side comparisons on stage to prove it. When Richard Yu. the Huawei executive in charge of its smartphone, PC, and tablet business showed a slide comparing the two, people in the audience laughed. Yu also chuckled. He hyped the Mate 20 X on stage not just for its apparent superior cooling technology (gaming makes smartphones get notoriously hot) but also for all the ways it’s apparently better than the Switch. For instance, he pointed out that the Mate 20 X has a 7.2 inch screen as opposed to the Switch’s 6.2 inch one. The Mate 20 X is 1080p whereas the Switch is only 720p in handheld mode. 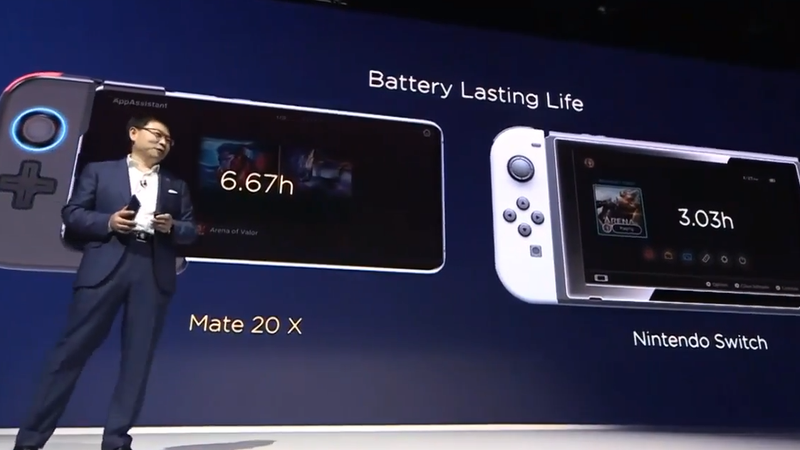 According to Yu, the Mate 20 X’s battery life is also twice that of the Switch’s. But that’s not all! What really makes the Mate 20 X a Switch-killer is apparently it’s gamepad add-on which includes an analog stick and d-pad and attaches onto the left side of the phone. Yea, it’s basically a glorified version of the 3DS’s circle pad pro attachment. Yu was generous not to mention that Switch still only has access to one app, Hulu, and you can’t even make calls on it. Of course, there are two differences between the devices that matter more than anything else: the Mate 20 X costs about $1,000 (the Switch sells for $300) and doesn’t play The Legend of Zelda: Breath of the Wild or Super Mario Odyssey. As far as its competition among other gaming smartphones, however, it’s harder to say. Razer recently launched the Razer Phone 2 which includes its own vapor cooling chamber and comes in at $800. Razer’s also selling a seperate controller attachment for the device, but it’s basically an Xbox controller with a spot to mount the phone than a Joy-Con-lite. And then there’s Asus’ ROG Phone, which is the most ridiculous looking of them all. It comes in with 8GB of RAM and a price tag of approximately $1,160. It’s controller attachments are the most like the Switch’s though, just smaller and boxier than the Joy-Con. Asus pitched it as the best phone to play PUBG on, and they may be right, even if it does cost as much as a very nice PC gaming rig. As easy as it is to laugh at all of these smartphone manufacturers trying to ape the Switch’s success, however, it doesn’t seem entirely foolish. With Google, Microsoft, and other companies all pushing forward into the brave new world of video gaming streaming, smartphone gaming feels poised for an evolution. An expensive smartphone with all the bells and whistles might seem like overkill for Final Fantasy XV: Pocket Edition or even Fortnite, but being able to stream Forza Horizon 4 or the next Halo game to it in the future makes it a lot more tempting.